With the generous support of our Adventure Kokoda trekkers we have been able to establish Network Kokoda as a philanthropic organisation to honour the legacy of Papua New Guinean Wartime Carriers. Network Kokoda is registered in Australia and Papua New Guinea. We are hopeful that our application for tax deductibility will soon be approved. Our Adventure Kokoda Trust was established to enable trekkers to leave a footprint in Papua New Guinea. Over the past decade we have placed more than 4000 books in the Port Moresby Grammar School library; sponsored student scholarships; provided educational supplies to all village schools along the Kokoda Trail as well as medical supplies to local hospitals and health centres. In 2009 we established Network Kokoda as a not-for-profit organisation, to provide money, property and benefits to the people of Papua New Guinea through supporting education, health and leadership development initiatives – providing partnership opportunities between Australia and Papua New Guinea. As we reflect over the past year our proudest achievement has been the establishment of an agricultural learning project at the Sogeri National High School – about half-way between Port Moresby and the start of the Kokoda Trail at Owers Corner. During the war the the Sogeri Plateau was the food bowl for Port Moresby however since then much of it has reverted to subsistence farming. Around 500 students’ board at the school and their diet is based on rice, tinned fish and not much else. Adventure Kokoda was the foundation sponsor of Network Kokoda – a foundation established to honour the sacrifice of our Kokoda veterans and PNG wartime carriers. Network Kokoda has based its philosophy on Community Learning Development Centres established by the former Minister for Community Development, Dame Carol Kidu. We have engaged Mr Sandy Lawson, an agricultural scientist who has spent most of his woking life in PNG. Sandy is fluent in Tok Pisin and Motu and familiar with a number of other languages. 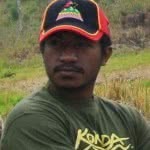 He has an empathetic understanding of Melanesian culture and is highly respected by Koiari and Orokaive leaders. 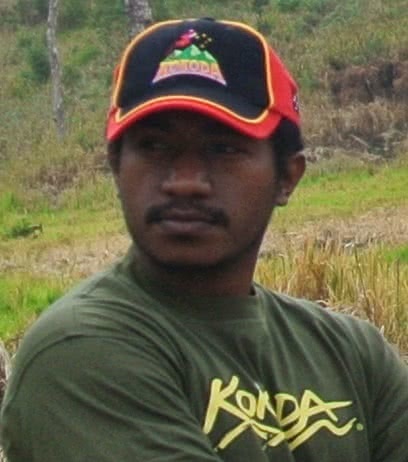 We have also engaged Oggie Erehetonz (pictured)who has a Diploma in Tropical Agriculture from University of Natural Resource and Environment in Popondetta. Oggie is an outstanding young graduate who is very keen to manage our Integrated Community Agricultural Learning Centres on the Sogeri plateau. Our next objective is to replicate this project at Kokoda. Adventure Kokoda recenlty donated $35,000 to assist in the establishment of Network Kokoda – a foundation which aims to develop a Master Memorial Plan for the Kokoda Trail in partnership with the Australian War Memorial, the RSL and the Kokoda Track Authority. Network Kokoda also plans to work in partnership with the PNG Department of Community Services to establishe Community Learning Development Centres along the Kokoda Trail and other areas in PNG in recognition of the PNG Wartime Carriers. Adventure Kokoda continues to develop its philanthropic programs along the Kokoda Trail with the help of our trekkers. In 2009 the company introduced a ‘Yumi Helpim Pikinini’ Program which saw 120 backpacks filled with educational, health and sporting gear delivered to village students.